There is a new entrant into the fight against Head Lice. 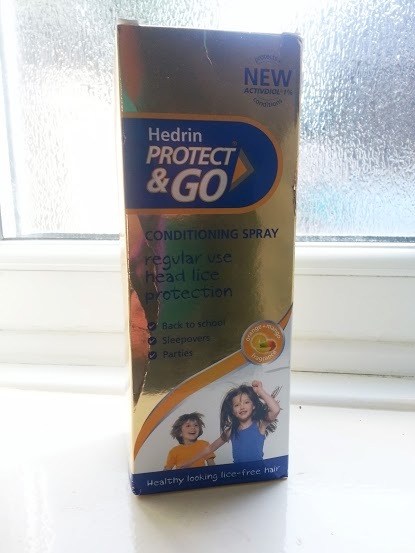 Hedrin have produced Protect & Go Conditioning Spray as a whole new way of beating the bugs. Instead of waiting until you have head lice already, Protect & Go is designed for regular use when you don't have head lice, but are at risk from catching them - for example sleepovers, when school send you those 'a child in your child's form has head lice' letters or when one of your other children has head lice. Unlike most head lice treatments, which you apply to the hair and leave for a certain amount of time before rinsing away, Hedrin Protect & Go is applied and left. If you wash your hair, or after around 4 days, then the treatment is no longer effective and will need to be re-applied, but as long as you use it twice a week then it should kill lice as soon as they set up home on your head, before they lay any eggs and cause an infestation. What I like best about this treatment is that it contains no 'poisons' harmful to you or your children. The active ingredients are a surfactant Activdiol (1,2-Octanediol) that breaks down the waxy layer on the outside of a louse and causes it to dehydrate rapidly, and Dimeticone, which is a silicone oil and smothers the louse, affecting it's ability to get rid of excess water and rendering it unable to move. They either die from gut rupture, starvation or dehydration. When I agreed to this product review I didn't realise just how useful it would be. As it turns out we've had head lice in my household over Summer, so I was perfectly placed to test it! We discovered at least 3 of our children had head lice midway through the Summer holidays. 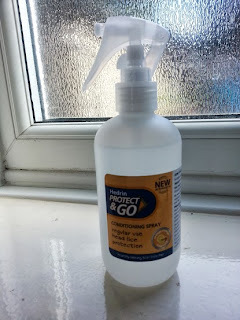 After using a treatment lotion and the combing and conditioner method I have ensured the rest of my family have used the Hedrin Protect & Go to try and prevent anyone else becoming infested. So far Hedrin Protect & Go seems great and I haven't found any lice or nits on anyone who we know didn't previously have them. With 7 children who rough and tumble and play together all of the time, head lice are swiftly passed from person to person. Even sitting together reading a book makes is a great way to allow them to pass from head to head - so I've been using the Protect & Go myself. I've been really pleased with the results and the product. It has an orange and mango smell, which is really nice and fresh, and as it's a leave-in conditioner it has made everyone's hair lovely and soft. It doesn't make the hair greasy at all, although when you wash your hair you can tell it had something on it. The bottle itself has a nice big lock to prevent accidental spraying, and is a good size to last a while. It has a great trigger spray, so you only take seconds to spray your child's head after washing their hair and towel drying. The price is good, around half that you would pay for the equivalent size of treatment spray or lotion, and you don't use as much. It will not remove an actual infestation, it will only knock it back as it doesn't harm the eggs (nits). I think this is a great product for a family such as mine, but even if you only have one or two children then I can see times when it would be especially useful. I will continue to use it whenever we have an outbreak to try and minimise the spread throughout my family, and I shall use it on my youngest two whenever school issue us with a 'head lice letter'. I've written a blog post which hopefully can tell you all you ever wanted to know about head lice - including a video and photo's. You can find my post by clicking this link. That sounds really good Jen, and a great price. Fingers crossed it does the trick! i hope i wont need this but thanks for letting me know! Head lice, the nuisance of any large family! something we all hope to never need, but prevention is better than cure. It is, definitely - far cheaper and less time-consuming for a start! Nice to know there's different stuff about these days that works well. Never had anything like this when I was little. Nice review, thanks. This sounds like a great idea - a prevention treatment rather than using after they already have them. I'm itching too now though! I imagine it would be costly if you had to use this twice a week by time the child is an adult. Especially if you have more than one child. I think I'm a cross-my-fingers and cross that bridge when I come to it, person. I couldn't afford to use a product like this. I was always cuddling my friends as a kid and I've never had headlice in my life.